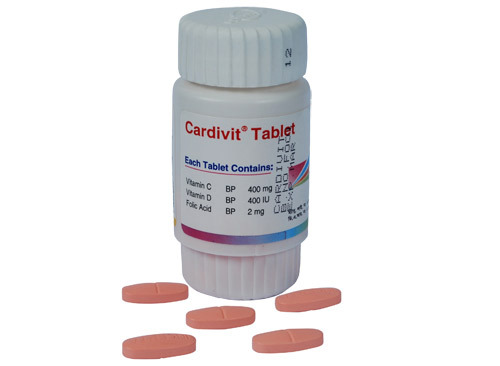 Each tablet contains Ascorbic acid BP 400 mg, Colecalciferol BP 400 IU (as Vitamin D3) & Folic acid BP 2 mg.
Ascorbic acid (vitamin C) & Folic acid (also known as Vitamin B9) are water-soluble vitamins. Vitamin D is fat-soluble. Ascorbic acid helps integration & cohesiveness of cells by synthesizing collagen which is also known as biological glue. It is also a powerful antioxidant in the aqueous media. Vitamin D is also known as antirachitic and sun-shine vitamin which displays its roles like a hormone (pro-hormone). Vitamin D spares calcium in the body by reducing excretion and enhancing calcium absorption. Folic acid is crucial for proper brain function and plays an important role in mental and emotional health. It aids in the production of DNA and RNA, the body's genetic material, and is especially important during periods of high growth, such as infancy, adolescence and pregnancy. It controls blood levels of the amino acid Homocysteine. Elevated levels of this substance appear to be linked to certain chronic conditions such as heart disease. Indications: Deficiency states of Vitamin C, Vitamin D and Folic acid associated with cardiovascular diseases, Deficiency states of Vitamin-C (Scurvy, generalized weakness, gum bleeding, after acute infections, alcoholism and postoperatively), Wound healing, Prevention of cold, flue and influenza, Megaloblastic anemia and anemia of nutritional origin, Deficiency states of Vitamin-D (Intestinal malabsorption, chronic liver disease, osteomalacia, osteopenia, rickets, hypocalcemia, institutionalized patients, persons who use sunscreen, black people, person who covers most of the body surface due to cultural and religious purpose). Familial hypophosphatemia, Hypoparathyroidism, As adjuvant with calcium supplement, Prevention of osteoporosis and fracture alone or in combination with calcium supplement, Conditions where demand for Vitamin-C, Vitamin-D and Folic acid increases (pregnancy, lactation, smoking and old age, person living in polluted environment). Once daily or as directed by physician. Side-effects: Vitamin C & Vitamin D are well tolerated and side-effects are very rare at the recommended dose. Allergic sensitization has been reported following oral administration of folic acid. Precautions should be exercised if hypersensitivity to any of its ingredients is manifested. Pregnancy: There is no contraindication to the use of this preparation in pregnancy. Lactation: There is no contraindication to the use of this preparation in Lactation. Contraindications: This combination is contraindicated in hypercalcemia, hyperparathyroidism, renal calculi, nephrolithiasis, Zoolinger-Ellison syndrome, concomitant Digoxin therapy (requires careful monitoring of serum calcium level).